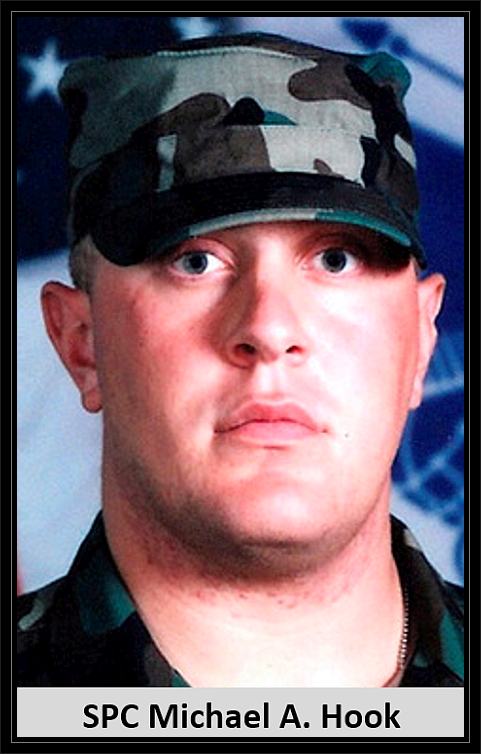 Hometown: Little Egg Harbor, NJ/Altoona, Pennsylvania, U.S.
Died: : August 22, 2007 in Operation Iraqi Freedom. Unit: Army, 2nd Battalion, 35th Infantry Regiment, 3rd Infantry Brigade Combat Team, 25th Infantry Division, Schofield Barracks, HI. Spc. Michael A. Hook, 25, of Altoona, Pa.; was assigned to the 2nd Battalion, 35th Infantry Regiment, 3rd Infantry Brigade Combat Team, 25th Infantry Division, Schofield Barracks, Hawaii; He died Aug. 22 in Multaka, Iraq, of injuries sustained when his helicopter crashed. Also killed were Capt. Corry P. Tyler, Chief Warrant Officer 2 Paul J. Flynn, Sgt. Matthew L. Tallman, Spc. Rickey L. Bell, Capt. Derek A. Dobogai, Staff Sgt. 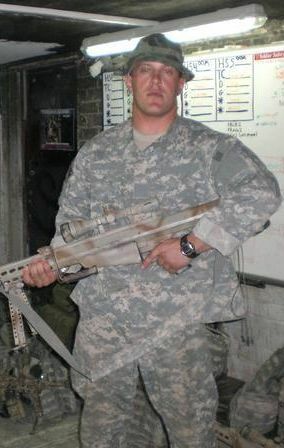 Jason L. Paton, Sgt. Garrett I. McLead, Cpl. Jeremy P. Bouffard, Cpl. Phillip J. Brodnick, Cpl. Joshua S. Harmon, Cpl. Nathan C. Hubbard, Cpl. Jessy G. Pollard and Spc. Tyler R. Seideman. He is the son of Larry E. and Maryann (Craig) Hook. Surviving are his parents; his fiance, Suzie Fetterman of Altoona; a sister, Marcia and husband, Henry Weatherwalk, of Altoona; paternal grandmother, Winifred Hook of Altoona; a nephew, Bradley Weatherwalk; and a niece, Mya Weatherwalk. He was preceded in death by his paternal grandfather, Howard E. Hook; maternal grandparents, Kenneth E. and Mary Louise Craig; and an uncle, Kenneth William Craig. Specialist Hook was a member of Our Lady of Mount Carmel Catholic Church. 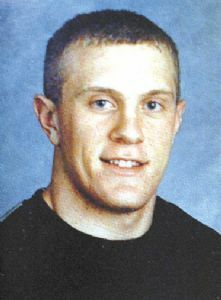 He was a 2001 graduate of Altoona Area High School. He enjoyed hunting, fishing, Penn State and Steelers football and weight lifting. Though he was buried at Calvary Cemetery additional recovered remains were interred at Arlington National Cemetery in October 2008. 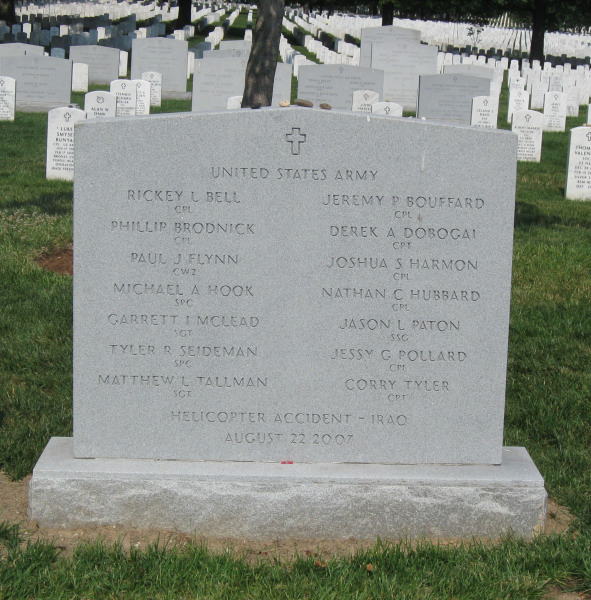 A marker bears the names of 10 Schofield soldiers and four helicopter crew members were killed when their Black Hawk helicopter crashed on Aug. 22, 2007, during a nighttime mission in Multaka, Iraq. He was 25. ALTOONA, Pa. — A soldier from western Pennsylvania who had ties to New Jersey was among 14 U.S. soldiers killed Aug. 22 when a Black Hawk helicopter crashed during a nighttime mission in northern Iraq, relatives said. Army Spc. Michael A. Hook, 25, of Altoona, had been in Iraq for almost a year on his first tour, said his father, Larry Hook, of Little Egg Harbor, N.J.
After graduating from high school in Altoona in 2001, Hook lived with his father and stepmother, Belinda Hook, in New Jersey and worked doing odd jobs for about a year before returning to Altoona. His mother, MaryAnn Hook, and his fiancee, Suzie Fetterman, both live in Altoona. 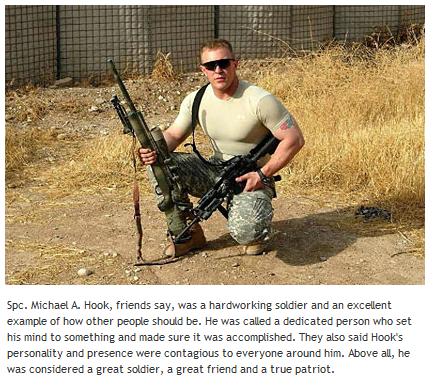 Hook was scheduled to return from Iraq in September, and an October wedding was planned. The Black Hawk was one of two helicopters and had just picked up troops after a mission when it crashed, according to Lt. Col. Michael Donnelly, a military spokesman in northern Iraq. The four crew and 10 passengers aboard were assigned to Task Force Lightning. Military authorities said it appeared the aircraft was lost due to mechanical problems and not from hostile fire. Hook enlisted in the Army about two years ago after working in Altoona for a roofing contractor, his father said. “He just decided he was going into the Army and I respected that,” Larry Hook said. “I don’t think he was real interested in going to Iraq ... but I think he was excited about coming home,” said Michael Hook’s grandmother, Winifred Hook of Altoona. Hook’s unit, the 25th Infantry Division’s combat aviation brigade, was expected to be back at its base in Schofield Barracks, Hawaii, by late September, his father said. Michael Hook was looking forward to coming home because his fiancee is pregnant, his father said. Hook played football at Altoona Area High School. “It was his dedication that I remember,” coach Phil Riccio said.